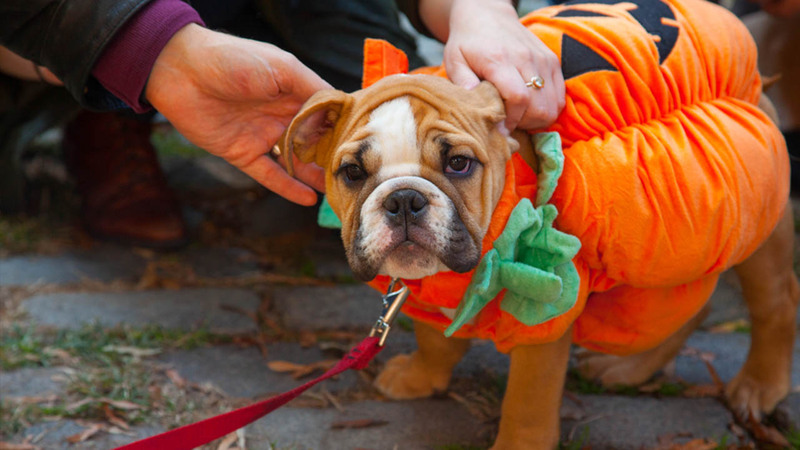 HOUSTON (KTRK) -- Think heading out to trick-or-treat with your pets will be fun for you and them? Not so fast, says the Houston Society for the Prevention of Cruelty to Animals. Going out with your dog can actually be stressful, according to information from the SPCA. Unusual sights like costumes or decorations can spook dogs that are normally quiet and docile, the organization said. If you do take them out, make sure you have a slip-free collar, so if they want to run, they don't jump out of their collar and run off. Planning to dress your pet up? Make sure the costume isn't too tight or restrictive. Check for parts of the costume that could impede circulation or come off and cause a choking hazard. Never leave a pet unsupervised with a costume, the SPCA said. If the pet is bothered by the costume, it's best to take it off. Pets can still be bothered at home if the doorbell is constantly ringing, so consider placing pets in a room far from the front door or doorbell, the SPCA recommends. And candy? Keep it far from your pets as most will cause problems. Chocolates of all kinds pose a toxic threat for cats and dogs. Candy wrappers can also be dangerous if swallowed. If you think your pets have ingested something dangerous, call your vet immediately, the SPCA recommends. Suspect animal cruelty from leaving pets outside or being used for pranks? Call 713-869-7722 or report it online at houstonspca.org.